Update 4/27/2012: This car has been marked as sold on the dealer's website. Update 2/5/2012: Somehow the links below were to a Targa with different photos. Price updated and links have been fixed. Posted on 12/29/2011: Here is one of the rare 25th Anniversary editions of the Euro Carrera 2.7 produced only in 1975. While the anniversary edition is unique, it was also available on 911S at the time and hundreds were produced in total. Personally I find this an interesting combination with the full tweed interior, though I'd prefer having the Carrera script and whaletail. 1975 Carrera 2.7 anniversary edition. It has never been completely restored, it is still in original paint, interior and its purpose tweed carpets are in mint condition. There is no rust, engine order is 100% dry. It owns and purpose while their file maintenance book original invoice, the original package and its tool compressor. Type 911 Carrera anniversary "25 Years of Porsche"
M 422 Blaukpunt "Bamberg Stereo"
Offered for 109,900 EUR by the seller on mobile.de. Updated 3/26/2012: This really great looking Carrera sold at Techno Classica Essen 2012 for 100,000 Euros. Updated 2/16/2012: Seller contacted and indeed the seats have been recovered with the correct basketweave using NLA NOS material. Posted 12/1/2011: This 1974 Euro Carrera 2.7 looks absolutely stunning in the bahama blue (aka acid blau) color combination and chrome trim. This is certainly one of my favorite color schemes. 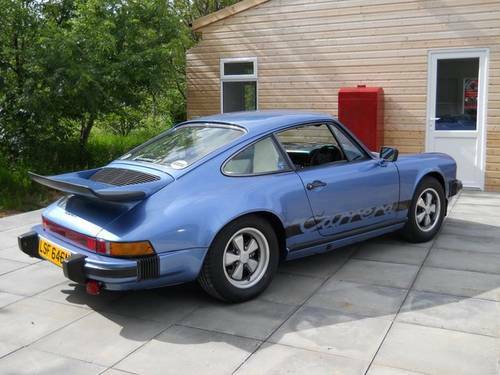 The Carrera has been recently restored and with all the attention to various details such as toolkit, correct but not original owner's manual, air compressor this may appears to be a Carrera worth investigating if you are looking. The blue/black interior is an often discussed desirable combination, though this doesn't look quite like ones I've seen in the past. I can't quite tell from the photos but it appears to be perforated leather rather than basketweave. We are pleased to offer a rare opportunity to purchase a highly desirable non-sunroof Porsche 911 2.7 Carrera. Originally delivered through Porsche dealer Gottfried W.Schultz, Ratingen, Germany in January 1974, this car represents one of the very early Impact Bumper ‘G’ Carrera’s and mechanically identical to the iconic prior year 1973 RS Touring. 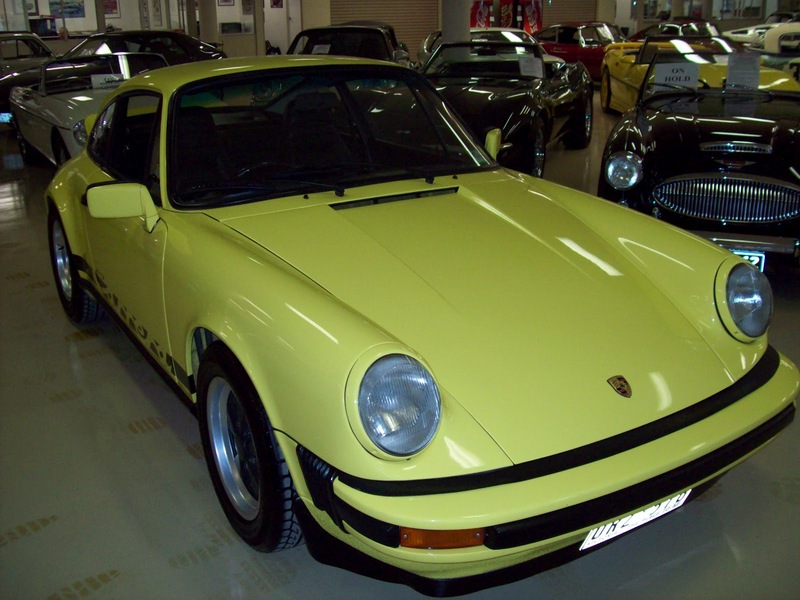 This car represents an outstanding Investment potential, as just 1036 Coupe versions of the 1974 Carrera were built. The 2.7 engine is the correct ‘period matching’ 664xxxx, it was fully rebuilt with new pistons and liners and complete overhaul in the USA, and covered approx 20Tkms since. It has very good cylinder leak test figures, and also features the correct ‘019’ Bosch Fuel injection pump. The 915 gearbox is very good mechanically The wheels are the correct ‘period’ date stamped late ’73, and have been refinished to the correct ’74 spec’ petalled finish. 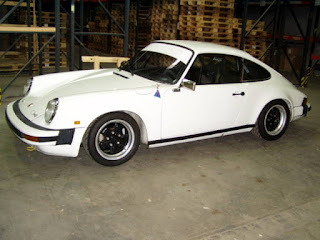 *All German delivery Carrera’s were delivered without ducktail spoiler, as it did not meet pedestrian safety legislation. In its original delivery specification, it would have had a plain engine lid with rear wiper, and no front spoiler lip. It is currently fitted with spoilers, as this is the iconic look for the car, but could be reverted to standard specification if desired. This particular vehicle was exported from Europe in the early eighties, by a US Air-force pilot, who resided in SOCAL, USA. The vehicle has remained in the perfect Southern California climate for historic cars for some 30 years, until being re-imported back to Europe (UK) in November 2010. A comprehensive restoration has been performed by Porsche specialist Tech 9 Motorsport in Liverpool, UK. Fully documented rebuild photos are available by request. At the vehicles first public event during 2011 post restoration, it won its Concours class for post 1974 at the NW Porsche Club GB annual Concours event at Arley Hall. This outstanding vehicle remains in very good mechanical condition, and is ready to enjoy new ownership. Find it here listed on Classic Driver with a price of £85,000. 2/4/2012 Update: This Carrera sold to a new owner who is looking forward to participating in vintage rallies. Enjoy! 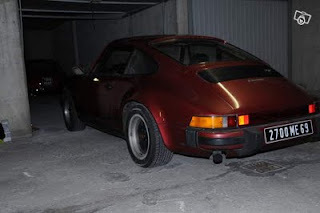 1975 Carrera 2.7 for sale by private owner. Current owner is mechanic who purchased the car roughly 25 years ago. Engine rebuilt around 18 years ago (approx. 8k kms). Incorrect flag mirrors for 1975. Many modifications, mostly minor, but would take work to correct (body work, keypad cut into dash, steering wheel, K&N air filter setup, etc. This is not one of the US restrictrd models,this is the real deal with 2.7-liter RS motor with MFI. older restoration by Porsche. All # match. Certificate of Authenticity. Only 8kml.on completly professional rebuild engine and transmission. Engine upgraded with Andial piston and cylinders,case alignbored, Dilavar studs, Twinplug modification ( sold RSR distributor),but has original distributor upgraded by Jerry Woods Racing. Pressure fed timingchain tensioners. New MFI Pump ( $3800.00) K and N Airfilter setup. Triad headers , Martin stainless steel lightweight GT type exhaust muffler. Took the lower sideskirts of and installed RSR front spoiler with functional airducts to brakes. Bilstein suspension otherwise stock. Carbon Ceramic brake pads. Interior is in perfect shape removed rearseats and finished it up with original carpet. Brandnew Gateshifter and couplerbushings . Some minor cracks on inside of whaletail. Paint is in fantastic condition . 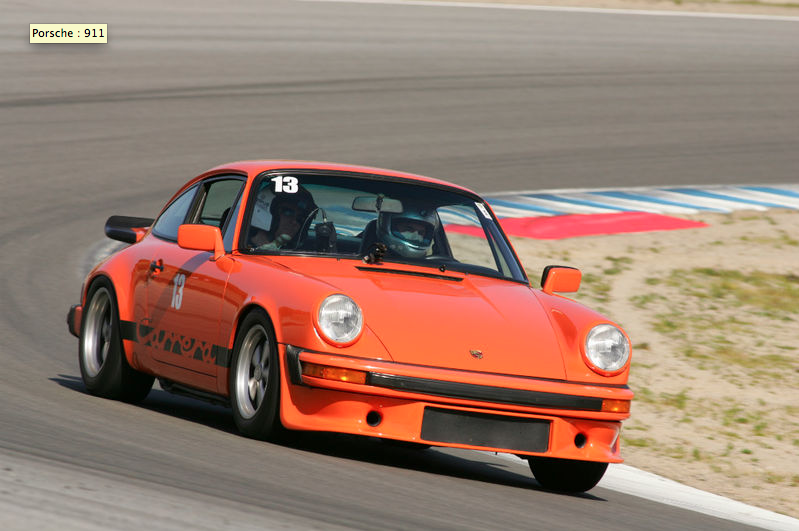 Listed forsale on eBay in Monterey, CA and available for viewing at Rennsport Reunion IV. Matching numbers 1975 Carrera RoW 2.7, advertised as a 1974. Unusual color, not sure if this was a special ordered color or repaint. This is one of only 3353 of this sought after model and has the same 2.7 engine tuned to produce 210 bhp as the 1972-3 Racing RS models. The car was supplied to Australia in 1974 but came to the UK in 1983 since when it has had only two owners, the last since 1994. It has been well looked after with a good well-documented service history and the engine runs superbly. Over the last few months it has undergone a major refurbishment of the bodywork costing over £8000. It is offered for sale on behalf of a local client and will come with a new MoT. Listed forsale at A1 Classic Cars in the UK. Updated January 13, 2012: Now listed for sale for $75,000 AUD on JustCars. Matching numbers 1974 Carrera RoW 2.7 in yellow/black found down under. Mirrors replaced with 1976+ mirrors. Find it forsale at The Healey Factory in Australia. 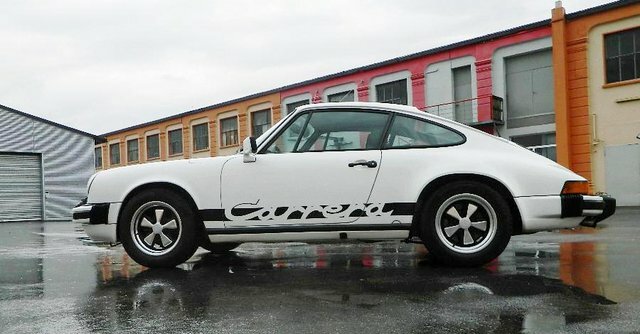 Two owner, Carrera RoW 2.7 with 77,000 km. White with black leather interior. 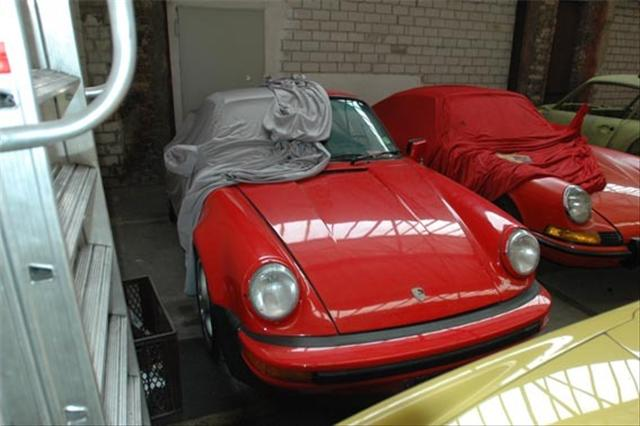 Originally delivered in Germany and had an extensive restoration carried out. This is an early G-series model with first registration September 25, 1973. Matching numbers. Priced at 79900,00 €. Find it for sale at Auto Salon Singen in Germany. Update on 7/7/2012: After a year on the market this Carrera was sold! Last asking price was $169,260 USD, selling price unknown. In 1947 when Ferry Porsche sketched out the very first drawings of what was to become the iconic 356 model he had a clear vision for the future of the marque: a Porsche should be sporty, yet with enough practical space for two passengers, their luggage and additional room for a further two companions to travel on short trips. So was created the 356, a car that used many proprietary parts from the recently reborn Volkswagen. In 1964, at the IAA in Frankfurt, the company launched the 911 model – everyone’s idea of a ‘typical Porsche’. 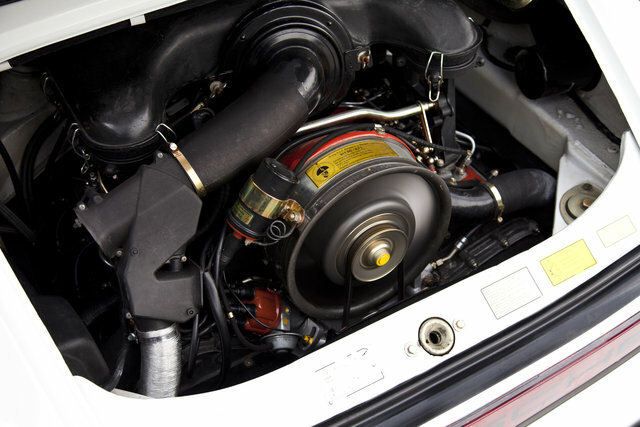 The 911 model was then constantly improved during the 60s and early 70s until it reached its zenith as a pre-black bumper homologation special: the celebrated 1973 Carrera RS with a fuel-injected, 2.7-litre engine producing 210bhp.This might be everyday knowledge, but what is less well known is that the earliest versions of the new ‘G model’ 911 were equipped with the very same 2.7-litre motor. And after the factory holidays in 1975, just 113 cars were completed with this famous engine and a zinc-coated, rust-resistant bodyshell. The Porsche you see here is from that last series of just 113 cars (number 84) and is fresh from a ‘no expense spared’ (60,000 euros) engine by Manfred Rugen Hamburg restoration. The interior is in excellent condition. This very rare Porsche offers the almost unique combination of the iconic 2.7 RS motor in the more modern, zinc-treated ‘G model’ bodyshell, and is an appreciating classic due to its very limited numbers (one of only 113). 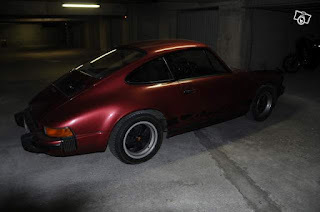 A matching-number car (both the gearbox and engine are original to this car, as certified by Porsche) other features of note include Fuchs wheels, original sports seats, an original electric mirror on the left-hand side and a limited-slip differential. Listed forsale at Zurich Collection. I have finally decided to put up for sale my RS Replica due to family and work commitments meaning that I will just not get to use it enough. Over the past ten years the car has been used mainly for UK and continental touring attending all the Classic Le Mans events as well as most of the Oldtimer Grand Prix at the Nurburgring in the last decade; it is therefore set up for fast road/touring use rather than being track focused. I have owned the car for ten years now having purchased from the previous owner who used Gantspeed to backdate his matching numbers 1974 Carrera to an RS Replica. 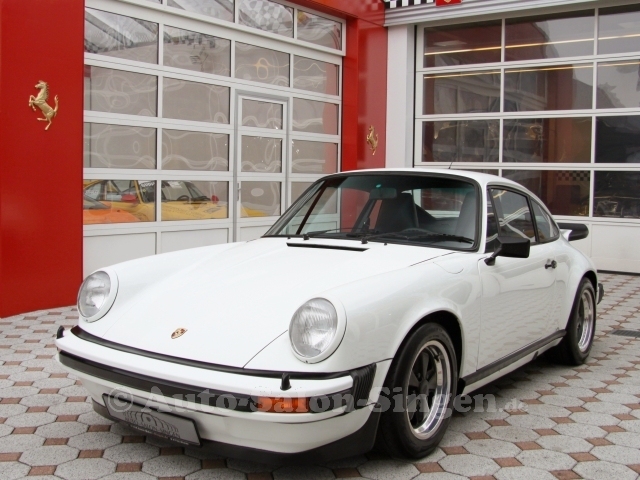 Vds 911 Carrera 2.7 04/1974 Chassis No. 911460XXXX Engine 911 / 83 210 hp Very good condition, owned since 1986, Tel: 0684649711. Only 6 Carrera RS’s were supplied new in RHD format, and it is strongly believed that one of these has been converted to a left hand drive. The result of this is that a genuine Carrera RS commands ‘telephone number’ prices. 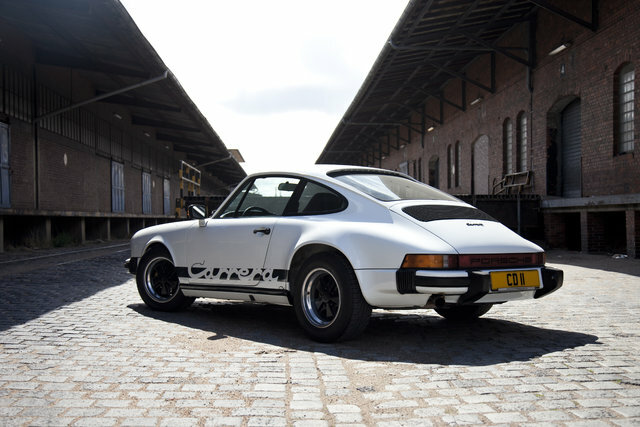 This Carrera RS was actually born as a 1974 2.7 Carrera, making the underpinnings of the car quite correct. The car was delivered new to the city of Hull in September 1974 and the car passed through four owners before it was bought in March 1986 and subjected to this completely irresistible transformation. The restoration, as you could imagine, was quite an involved affair, painstakingly carried out by the late great Peter Clark, a member of the BRDC, but perhaps better known as a successful Porsche racing driver. During the restoration, the sunroof was removed, and lightweight panels were used, glassfibre front and rear bumpers, and a lightweight rear engine cover and spoiler were fitted. Inside, lightweight Sparco bucket seats, Sabelt harnesses and a full FIA rollcage with fire extinguisher were fitted and rear seats completely removed. In the early 1990’s the car was fitted with a 3.2 litre engine on PMO carburettors – this produces a staggering 240 BHP and weighs a mere 1100Kg. In 2010 the gearbox and LSD was overhauled. This, coupled with the lowered Bilstein suspension and upgraded brakes, arguably makes HOT 222N the perfect 3.0 RS replica. The vendor describes the car as true in every detail, cherished, and meticulously maintained. It has been used only for trackdays , and the occasional trip to Le Mans in the last five years. This car has a full documented complete history file, including all MOT's from new right up to the present. It has been featured in many Porsche magazines, notably including recent write ups in Total 911 and Porsche world. Both highlight the quality of work, and the thrilling end result. As all Porsche aficionados will appreciate, the 3.0 RS continued the evolution of the 911, by bringing more predictable handling and greater cornering abilities- thanks mainly to a far broader track, the 930 style flared arches, whaletail rear spoiler and all in all more advanced engineering. Finished in the timeless colour of Grand Prix white, with red decals and decals, this car recreates the legendary 3.0 RS, a car that is as rare as it was capable and desirable. HOT 222N is offered at a fraction of the price of a real one and is remarkable value. See more at Coys Auctions. This is a show perfect 105,000 kilometer 1975 mechanical injected European RoW coupe. The yellow paint (11791) is in perfect show quality condition. We checked car with a paint gauge and it shows no filler. It appears to have one paint job over the original. This car was featured in Hemming Sports and Exotics in 2010. 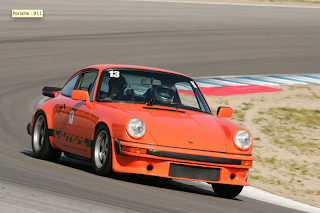 The car also won 1st place at a Porsche Club of America concourse events in Arizona (322.7 of 325 points). The engine top end, 2.8 piston and cylinders work was done by Redline Service 10,000 miles ago. At that time new intake and exhaust valves, valve guides, cam shafts reground by Web Cams, timing chains and tensioners were rebuilt and safety's were installed. The carpet and interior are very nice as well as the door panels (a RS type with yellow pull straps). The seats were reupholstered black with corduroy inserts. This car comes with three deck lids one whale, one plane, and the duck tail which is on the car now. The wheels are 7 and 8 X 15" Fuchs with Yokohama 94V es100's.The car just had its final inspection and service since rebuild and is ready to be driven anywhere. This car has a very large owner file with it. Receipts from Belgium in 1999 totaling $22,000. One invoice shows a new engine block (911/83 factory case). The other invoices up to present show a total of over $40,000. See more at Redline Service in Tucson, AZ. 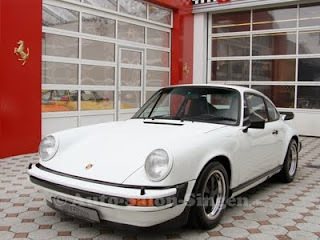 Porsche 911 2.7 SC FIN 911560xxxx, Motor 911/83 6650xxx, original transmission, Porsche birth certificate matching, and from 1977 the car was driven only in southern Italy, stainless, 2005 Complete restoration and conversion into a race car with FIA Wagenpaß Group 3 series production, bolt steel cage , a few races, fast, very good condition, no repair backlog, street legal ability, fixed price. This 1974 Euro Carrera 2.7 with 133,000 KM is for sale in Saint-Genis-Laval, France for € 55,000. 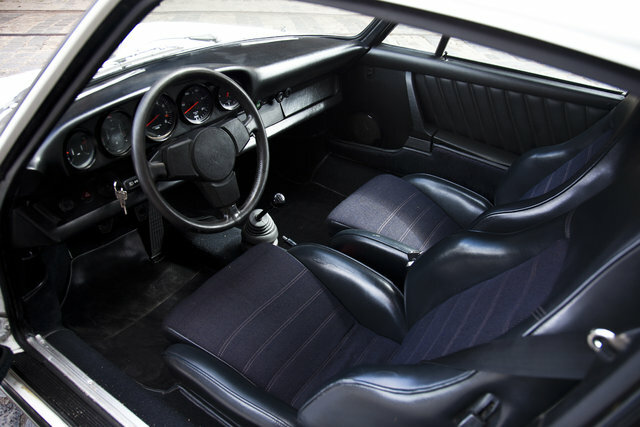 911 Carrera 2.7 04/1974 Chassis No. 9114600634 Engine 911 / 83 210 hp Very good condition, owned since 1986, Tel: 0684649711. AutoScout24 non si assume alcuna per la correttezza dei dati responsabiltà.